Our cat guides us as to where we should pet him. It’s a kind of reverse training. Cats do that quite a lot. A survey indicated that we enter into a sort of unwritten contract regarding social interaction. I think we can see that if we analyse our behaviour with our cat. Jackson Galaxy says let your cat come to you. This means let your cat make the move and show you where she likes it. He also suggests that some overdo petting which can stimulate a cat to bite in play (see video at base of page). Cat caretakers learn through the reactions of their cat the preferred spots which satisfy him. A cat makes it pretty clear when he or she is unhappy with what we are doing when petting. We normally pet our cat for are own pleasure. Our cat will also receive pleasure from it provided what we like is also liked by our cat. Cats indicate correct petting by staying still when being petted, moving their body and head into position to encourage us to stroke a certain area and giving us the slow blink (a visitor called this a “cat kiss”). Perhaps it is a bit like blowing a kiss. It is generally agreed that the preferred areas are the top of the head, the side of face and the belly (less often). The shoulders are safe areas. In my experience, the thigh area is often unacceptable to a cat and she will show it by moving slightly. Also touching the hind legs can be problem too. Each cat will have their particular sensitivities and preferences. 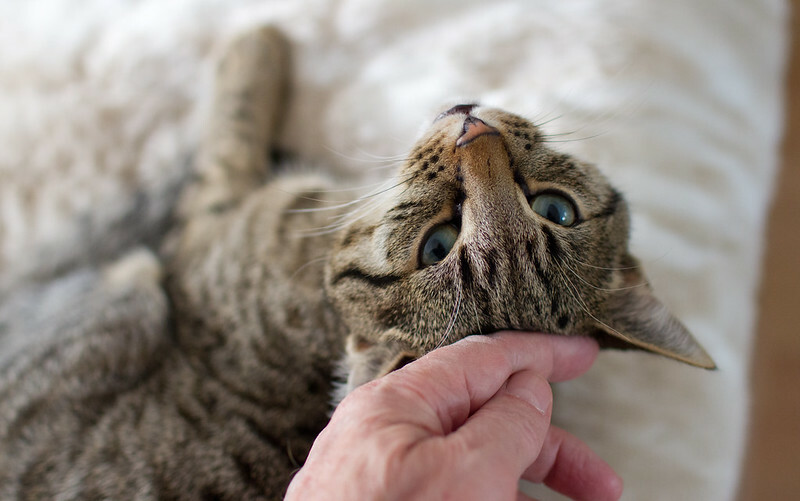 The survey (Bernstein 2000) found that cat caretakers believe that their cat also prefers a certain sequence when petting. I have not found this to be true but head to back to tail to stomach has been mentioned as a preferred sequence. Cats can also initiate petting. The classic ‘request’ is to lie down in front of the person and look at the person. These are routines. If we do something that our cat likes at a certain time and in certain way our cat might present himself to us at that time for some more of it. For example, when I lived with my three-legged cat Charlie he used to jump up on my bed after popping outside. He’d come right up to me and rest on my legs, looks up at me and wait for a dose of petting and grooming. I’m well trained. He liked to be carried into the kitchen for food. He preferred that as he had three legs and it was tricky for him to jump down from the bed. Apparently in some households individual cats prefer petting in certain parts of the home and they lead their human caretaker to that spot, stop and look up requesting it. Scientifically speaking, where are the usually preferred areas that a cat likes to be petted? In one study four areas were selected for testing. Three were areas where glands are situated: temporal gland between eye and ear, perioral gland on the chin and the lips and the caudal gland (the area at the base of the tail and lower back). The fourth is a non-gland area. The temporal gland between the eye and ear produced the highest number of positive responses. The worst area of five selected areas was the caudal area. 8% preferred the stomach and/or tail. For my part anywhere in the front half works! Even pulling ears gently, does not bother him Flea combing around the head area is both a form of petting and has a medical/functional role as well. A useful combination. Please comment using Facebook as the comments are also seen on Facebook thereby spreading the word (conventional comments are at the base of the page if you prefer). This entry was posted in petting and tagged petting a cat by Michael Broad. Bookmark the permalink. Most of my cats favour being stroked along the sides of their face, except for Horace, who prefers having the top of his head gently massaged by my fingertips. Sophie was not a cat who wanted a lot of physical attention, but she would always politely let me know she was ‘in the mood’ by patting my hand. Nowhere was off-limits. She even enjoyed having her belly rubbed, but when it came to her face, it had to be right hand/her left cheek, my left hand/her right cheek. If I used the ‘wrong’ hand, she would gently pat it away and touch the hand she wanted me to use (lol). Sophie was very precise in knowing what she liked! It does show that cat guardians are very aware of their cat’s likes/dislikes and moods etc.. compared to cat owners who are less involved and concerned.